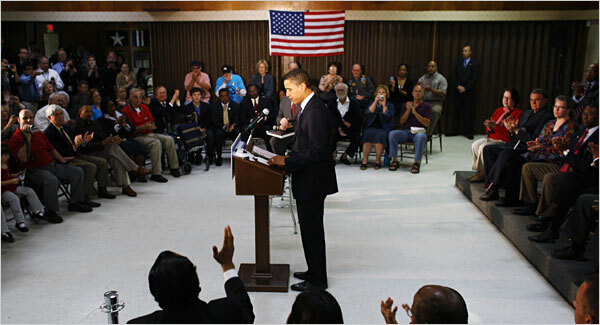 BARACK Obama speaking Friday (29 February) at a town-hall-style meeting with veterans at the American Legion Post 490 in Houston, Texas. The incident was one of the few times in this 13-month campaign that Obama’s actually been heckled, and he politely laughed it off as the man’s embarrassed comrades hustled him out of the hall. The scene was indicative, though, of the Illinois senator’s shaky first steps with labor. A year ago, many pundits predicted that John Edwards‘ populist message and tireless union wooing could earn him the bulk of labor endorsements, with Hillary Clinton‘s establishment mantle securing the rest. Most blue collar workers didn’t know what to make of the upstart Obama, who didn’t help matters by skipping one early labor forum due to a scheduling conflict – and falling flat in several others. Obama since has waged a long, quiet campaign for the support of national unions, emphasizing his community organizer past and the strong, virtually unified support he has received from their Illinois chapters. And in the last seven weeks the campaign has begun to reap the fruits, picking up new endorsements and getting close to neutralizing any advantage with organized labor that Clinton appeared to enjoy. Seven national unions, including the United Food and Commercial Workers, Unite HERE and the five-million member Change To Win coalition of unions – which includes the powerful Service Employees International and Teamsters unions – have all thrown their support behind Obama. The nods, and the tens of thousands of Ohio volunteers that come with them, could prove to be just enough to help swing the Buckeye State for Obama, and effectively sew up the nomination at the same time. In Ohio, which has lost hundreds of thousands of manufacturing and blue collar jobs over the past fifteen years, NAFTA has become one of the most contentious issues between the Clinton and Obama campaigns, which has done its best to try and link the former First Lady to her husband’s trade legacy. Clinton, like Obama, now supports amending NAFTA with enforceable environmental and labor standards, although at the time of its passage, and in at least one of her subsequent best selling books, she hailed NAFTA as an achievement. The nation’s largest umbrella labor organization, the AFL-CIO, has yet to endorse a candidate, though they freed member unions to endorse whomever they wished. So far 12 of those unions have picked Clinton, including the powerful American Federation of State, Municipal and County Employees and the American Federation of Teachers; just five chose Obama. It wasn’t until Super Tuesday, in Georgia and his home state of Illinois, that Obama started to win the union vote. Since then, though, he’s won labor in Maryland, Virginia, and Washington DC. And, in a resounding victory that could presage a come-from-behind win in Ohio, Obama won Wisconsin 58% to Clinton’s 41%, evenly splitting the union vote in a state where a third of Democratic primary voters come from union households; by contrast, 44% of Ohio Democratic voters come from union households. Still, ever mindful of downplaying expectations, the Obama campaign is quick to stress that Ohio has been an uphill fight for them. “Two months ago we were down by 20 points here,” said Ben LaBolt, Obama’s Ohio spokesman. “And we’re still behind in the polls. This was always going to be a tough state for us.” Indeed, not only does Obama still trail the New York senator by 4 percentage points, according to a Real Clear Politics average of Ohio polls, but amongst union voters he trails her 56% to 34% in the latest Cleveland Plain Dealer poll, conducted February 27-29. Either way, Obama can already claim one crucial victory; by effectively splitting labor’s endorsements with Clinton, he has prevented her from solidifying what was supposed to be a reliable part of her base.